Great capture of your son on the swing...looks like you were both having fun. I love the picture of your new shades too. Very creative. it's not easy to take a self portrait. wow that is one fat lizard. I'd jump like a deer if that crosses my path haha. Hope the check ups went fine. Have a great vacation Deb! S.
Love the new shades. I hope you have a great vacay! Great snapshots! That lizard is so cute. Love the swing shot. Have a great day! Love that sweet collage...have a great week ahead!! Wonderful photos. Love that lizard and your new shades. :) Thanks for linking up. Have a great week. What a sweet week in photos :) beautifully presented. That lizard is so cute. Love that shot of you in the new shades- your hair looks FABULOUS!!! I always look forward to seeing your collage and this one certainly does not disappoint! Great photos! I love the lizard. 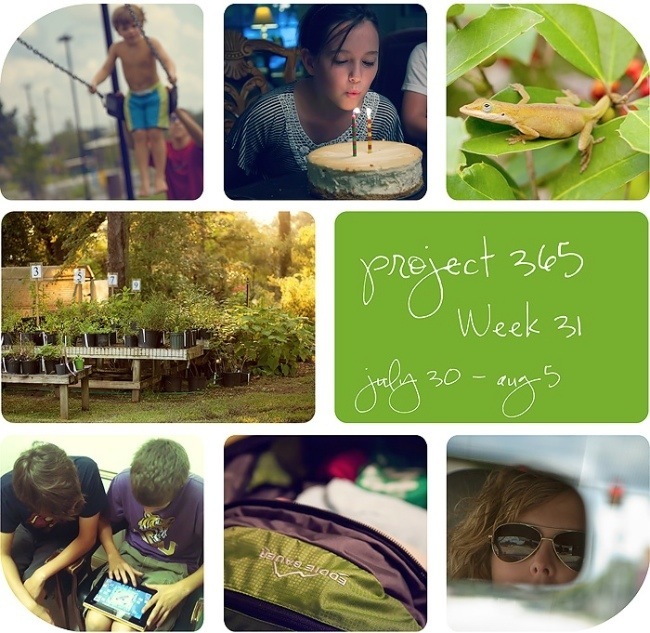 You took some really neat shots this week. What a great week again! And I love your shades! Have a wonderful Sunday! I love that lizard shot! I presume since you're all packed you're on vacation with your new shades? Have a great week! Great collection of pictures. Hope you have a lovely holiday. Great snaps this week...love the new shades shot! =) and the EB backpack! ... love my EB backpack! =) have a lovely week away! Great pics and LOVE the shades!